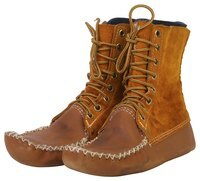 Daniel Boone moccasin boots are made of one piece of leather sown together with natural or artificial sinew. Materials include soft-tanned deer, elk or buffalo hide. Leather of 3-4 oz. weight, medium thickness, is recommended for soft-soled moccasins. Rawhide is used on the bottom of hard-soled moccasins. It is more difficult to sew but provides better protection in harsh environments. Lay out the pattern on the leather hide so that the pieces match with the grain for a uniform look. Measure a piece of newspaper the length and at least twice the width of your foot. Fold the paper in half length-wise and lay it on the floor. Place your foot upon the newspaper. Leave a 1/4 inch space between the heel of your foot and the bottom edge of the paper. Leave a 1/4 inch space between the ball of your foot and the folded edge. Trace an outline of your foot onto the paper with the marker. Remove your foot from the paper. Draw a line 1/4-inch outside the original line tracing from the ball of the foot around the toes. At the little toe, draw the marker in a straight line down past the outside of the foot to the heel and the edge of the paper. This outline is the pattern for the moccasin. Cut out the pattern with the scissors starting at the ball of the foot, leaving the fold intact. Open the paper. It should look like a letter "m" when unfolded. Cut a piece of paper 3 inches wide and 4 inches long. This will be used for the tongue pattern. Repeat steps 2 through 6 using your other foot. Place the unfolded pattern flat on backside of the piece of leather. Trace the pattern onto the leather with the marker. Cut out the leather around the line of the pattern. Fold the leather in half length-wise with the backside out. It should look like the original folded pattern. Place a pin in the top, bottom and side to hold it together. Cut a two-foot piece of the artificial sinew and thread it through the beading needle. Tie a knot in the end of the sinew. Put the needle through the leather 1/8 inch from the edge and starting at the big toe. Use the thimble to protect your finger and the needle-nose pliers to help pull the needle through the leather. Whip-stitch the edges of the leather together from the big toe and around to the start of the fold on the inside of the foot. Tie a knot and cut off the excess thread. Put the needle through the leather 1/8 inch from the edge and starting at the big toe again. Whip-stitch the edges of the leather together from the big toe and around the outside of the foot to the heel but not across the bottom edge. Tie a knot and cut off the excess thread. Fold the moccasin in half length-wise and fold again from top to bottom. Press firmly to make a crease. Unfold the moccasin. There should be a T-shaped crease in the leather. Draw an outline of the T-shaped crease with the marker and ruler. The top line of the T-shape should be 2 inches wide. Cut out the lines through the top piece of leather only. This will be the opening in the top of the moccasin to insert your foot. Fold the moccasin in half and flatten it so that the stitched edge and the folded inside edge are touching. The open T-shape should be at the top. Whip-stitch the heel of the moccasin together stopping 3/4 inch from the bottom. Draw a 3/4 inch line from the edge of the leather where the thread ended that is perpendicular to the bottom of the heel. Cut a 3/4 inch notch in the leather at the mark. Turn the moccasin flat so that the T-shaped opening is at the top and the bottom is touching the work surface. The 3/4 inch notch should be protruding out of the back at the bottom of the heel. Tuck the notch inside of the heel and whip-stitch the fold to close the hole. Turn the moccasin right-side out. Trim the notch into a semi-circle and whip-stitch it to the back of the heel. Repeat steps 1 through 19 to make the second moccasin. Trace the pattern for the tongue on a piece of leather. Center the tongue across the top of the moccasin right-side down so that the edge matches at the “T” of the opening. There will be a 1/2-inch overlap on each side. Whip-stitch the tongue to the moccasin. Whip-stitch each overlapping edge to the corresponding flap at the ankle on the side of the moccasin. Repeat steps 1 through 5 to attach the tongue to the second moccasin. Measure the length of your leg from the ankle to the calf to make a pattern. Measure around your ankle and calf. Draw a pattern on the newspaper based upon your measurement. Cut out the pattern and place it on the leather. Cut two pieces of the leather using the pattern. Whip-stitch the section of leather corresponding to the ankle to the top of one moccasins. Repeat steps 1 through 6 to create the upper on the second moccasin. Wrap the tape measure around your leg to the height that you desire for the straps. Measure and cut a 1/2 inch wide strip of leather to twice the length of your measurement. Punch a hole in the ankle area of the moccasin on both sides just above the tongue using the awl. Slide the strip of leather through one hole, across the top of the tongue and through the other hole. Repeat steps 1 through 5 to make the straps for the second moccasin. Put the moccasins on your feet. Place the uppers against your legs, wrap the straps around your legs in a crisscross pattern and tie a knot at the top to hold in place. Practice making the moccasins using felt instead of leather.